The state of health science in the US today is not weak, but it is under threat. The main problems: 1. p-value hacking. 2. commoditization of adjunct and postdoc labor. 3. disincentives of null value results or replication. All of these things threaten the foundations of the increasingly unsustaiunable edifice that is modern health science, and all of them derive in one way or another from the same root problem: the only source of objective funding, untainted by corporate interests, is the NIH. In essence, health science is a zero-sum game. This is why the Trump Administration preliminary budget proposal is ominous: it specifies an unprecedented 18% cut to the NIH budget. 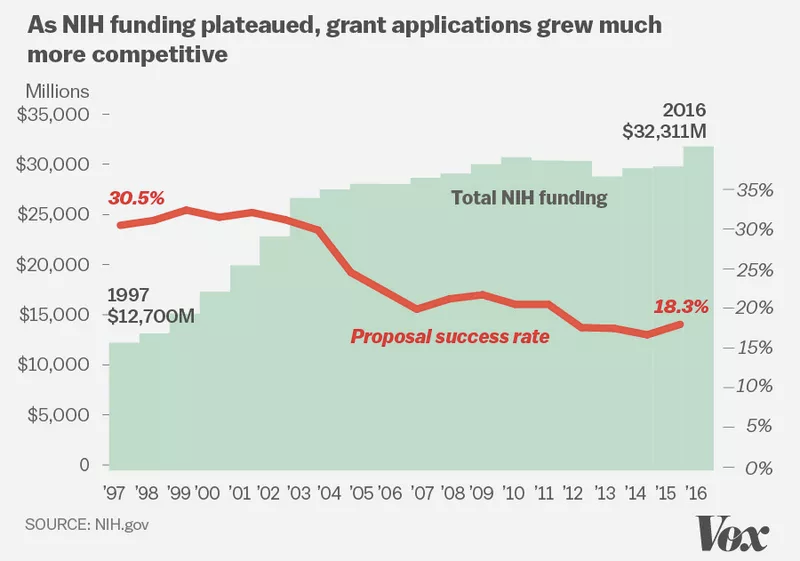 As the image above illustrates, grant applications have grown almost twice as competitive over the years as NIH funding stayed constant. An 18% cut in this context is like an amputation. There is only one possible outcome of this: labs will shrink. Health science research is going to be dramatically curtailed. Maybe there are benefits, in the long run, to this – but in the short run it will only worsen – severely – the problems that health science research currently faces. The question is, how resilient is the health science establishment? We are going to find out. Even though I left academia, I will be marching for science on Earth Day. Related: great article at The Atlantic that points out how private funding is a drop in the bucket compared to government support. In my opinion, public science funding is as critical and as irreplaceable as national defense. A change in US labour regulations will render many postdocs eligible for overtime pay — and create an incentive to raise their wages. The law may ultimately mean fewer postdocs. But some say that the policy could spark much-needed changes to a research system that relies heavily on postdocs yet offers them few opportunities for career advancement. The new rule, finalized on 18 May by the US Department of Labor, will make overtime pay mandatory for many postdoctoral researchers who make less than US$47,476 per year. Overtime, which is paid at 1.5 times the normal hourly wage, kicks in once workers exceed 40 hours on the job in one week. The problem, as the article itself points out, is that it’s relatively painless for a PI to raise their postdoc salary just enough to meet the minimum required to avoid triggering the overtime requirement. This would mean a raise, but only a few percent, and does nothing to address the broader structural problem facing lack of advancement opportunities for postdocs within the field. Even if postdocs salaries were raised to 50k across the board – which would have a wonderful impact on distributing postdocs across the country and strengthening science at research institutions nationwide – it would do nothing to alleviate the oversupply of postdocs that is destroying career advancement. Congress can’t really achieve more than incrementalist change like this overtime proposal, but the NIH has far more leverage. The NIH imposes salary caps on the amount any given indiovidual may be paid out of an awarded grant. There is no reason the NIH can’t set a minimum level, however – and doing so would not require legislation in Congress and the political process. It would simply be an overnight change. 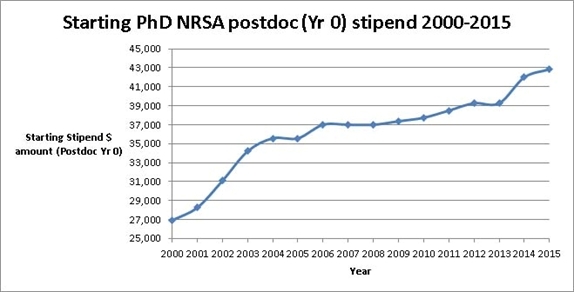 Imagine for example if the NIH immediately mandated that all postdoc salaries funded by R1 grants had to be funded at 150% of the current NRSA level. Likewise, graduate student support could be immediately mandated as 100% tuition plus stipend. The actual amount of funding however would not change – just the allocation of how that (taxpayer) money is spent. (This would have to apply to all new grants effective the next fiscal year, and not affect currently-funded grants). The immediate effect would be that fewer graduate students and postdocs could be supported. This would have many downstream ripple effects, but the biggest one would be an exodus of highly trained individuals from academia into other fields and industry, and entrepreneurship. This sounds like a bad thing for science, but the bottom line is that science has progressed on exploited labor for far too long. There are other areas of reform that need to follow, including paying institutional overhead out of grants and the adjunct faculty problem. But those are going to require a. substantial legislative solutions for which there isn’t the political will (because it will cost taxpayer money), and b. self-organization towards unions and collective bargaining, for which there isn’t professional will (because it will require the threat of strikes). Bluntly, science achieves what it does by treating its most valuable assets as commodities. It’s time to revalue, and that will require significant effort. The issue of underpaid postdocs and PhD students is one that is relatively easy to solve, and in doing so will provide much-needed impetus towards those other problems. I think that solving those issues will in turn lead to solving the other great problem science faces, namely the output problem. But that’s a topic for another day. The 2nd annual accelerated imaging workshop at UW Madison is next week, and should be a great event. There are scheduled speakers from Mayo Clinic, Northwestern, UIUC, Berkeley, Harvard, the NIH, and GE Healthcare (among others). If you think you might be able to attend, the free registration deadline is Saturday June 12th, otherwise you can register on-site for a nominal fee. Here’s the registration form, which you can fax or email in. 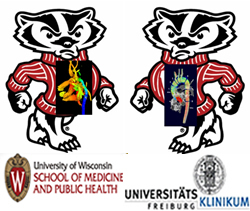 The International Center for Accelerated Medical Imaging at the University of Wisconsin, Madison, USA and the Dept. of Diagnostic Radiology, Medical Physics, at the University of Freiburg, Germany are co-hosting the 2nd Workshop on Accelerated Medical Imaging ‘Rapid MR Imaging – Beyond the Nyquist Limit’. Objectives of this workshop are to discuss the current state of the art accelerated imaging concepts and applications, roadblocks to clinical applications and strategies to effectively address these limitations. Invited speakers will present keynote lectures on pertinent topics with further presentations by contributed papers. The workshop in Madison will also be tailored towards students’ education. Extended poster viewing and discussion sessions are an integral part of the scientific program and will allow discussions about new concepts. The workshop will take place in Madison, WI at the Health Science Learning Center (HSLC), which is located on the University of Wisconsin-Madison campus adjacent to the UW Hospital & Clinics. The workshop announcement in pdf format can be found here. If you don’t want to download the PDF of the program, I’ve embedded it below the fold. Also check out the official workshop website on the UW Madison website for more details. If you attended the ISMRM meeting and were chased out of the poster session by angry Swedes for trying to take photos of the posters, then know that I’ll be uploading my own shots to Flickr later on. However, ISMRM is asking that everyone send their final PPT/PDF files of their posters as printed to posters10@ismrm.org, so they can post those online as well. Hopefully they will ask for these ahead of the meeting, and encourage people during the meeting to do so, next year. I suspect compliance will still be pretty low unless they market this more. Of course, they already have the e-posters, this is just regarding the traditional posters. Also, TODAY is the last day for submitting your CME online at: https://www.directsurv.net/ismrm.asp. Finally, they expect to have video of the oral sessions uploaded to the official site (http://www.ismrm.org/10) within a month. So be patient! 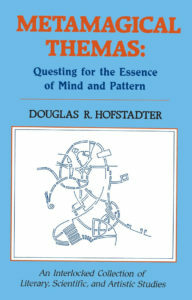 An incredible resource, well worth waiting for. Before the ink was dry on the government’s 2007 budget (or even completed for that matter), the Bush administration’s proposal for the 2008 budget was submitted on February 5th, and the news for biomedical researchers was not very good. According to sources the NIH is slated to receive a $500 million budget cut, before inflation is factored in—assuming a bill inflating their budget for 2007 passes through congress. Making this even more dire for biomed researchers is the fact that over 10,000 NIH extramural grants are up for renewal in 2008. Those contending for extensions or renewals of such grants are now faced with double difficulty: less money to go around and more people vying for the same number of spaces. Constraints such as these have driven the average age of first-time grant recipients to over 40 years old, barely a young researcher anymore. The simple truth is that the NIH is probably the single greatest investment of public funds apart from NASA in terms of knowledge generation for the benefit of society that the world has ever seen. Less funds mean less research; less Ph.D.s choosing an academic career; less innovation and less risk-taking. That means more orthodoxy, entrenched and defensive peer-review, and ultimately more echo-chambering. Even with new funding programs aimed at transitioning postdocs to faculty, it’s hard to justify doing a post-doc to people in the field nowadays – if they have the flexibility, they can make more than double the salary working for industry. What does the future of our field, medical physics and MRI in particular, look like? The most important criteria identified in the survey were access to training and experience that will prove useful, followed by access to books and journals, decent medical insurance, equipment, and the quality of the principal investigator. I’m not sure you’d find many postdocs who would disagree with these; if you’re going to spend three years of your life working on a project, then one would hope the skills and techniques learned would stand you in good stead in the future. Access to the scientific literature is vital, and if you’re not getting paid the earth, the ability to see a good doctor if you get sick is nice. Least important on the list of concerns was the opportunity to advance within the department, followed by administration issues. Again, this is probably due to the way academic careers work, where it’s beneficial to move from one institution to another for different stages of your career, that way maximizing exposure to the broadest range of techniques, methods and approaches to science. Some institutions are also notoriously reticent about promoting their own postdocs into faculty positions.